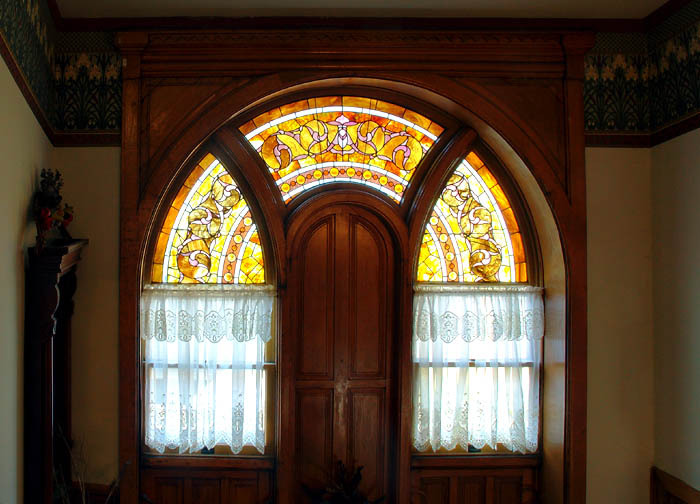 This window -- and the surrounding woodwork -- are located at the first landing on the stairs leading up to the rooms at the Inn. The stairs were behind me as I took the photo of the Music Room shown yesterday. I had to take and combine two separate shots to get both the Music Room photo and this one so the windows wouldn't be completely blown out and white while still showing some of the details of the space around the windows. I think it was worth the little bit of extra work, which was nothing compared to the efforts used over the years to keep the place looking as it does.